Hurricane Irma: Hurricane Irma hit Anguilla with a vengeance on September 5, 2017 and they could use your help! Anguillians are resilient people and are already hard at work clearing roads and helping each other wherever needed. But they are resilient people and determined to rebuild our island and to welcome visitors back as soon, so that visitors can enjoy Anguilla’s natural beauty and friendly hospitality. Anguilla is in need of assistance to help rebuild. To help the hurricane relief efforts in Anguilla, click here. shaded by coconut palms and sea-grape trees, and filled with colorfully painted, open-sided beach bars serving sizzling barbecues. 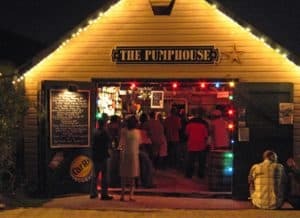 Sip feisty rum punches and listen to live reggae tunes here in Anguilla. 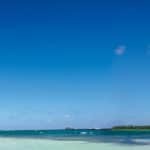 Its crystal-clear waters and vibrant reefs offer spectacular snorkeling, glass-bottomed kayaking, and sailing to tiny islets and atolls scattered offshore. 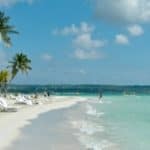 They are ranked #1 in the Caribbean for the best beaches, and as one of the top wedding destinations. Anguilla is about peace, pampering, great food, and a wonderful local music scene. Once the sun does go down, you’ll be treated to one of the best live music scenes in the Western Hemisphere. And if you like sophisticated cuisine served in a casually elegant open-air setting, this may be your culinary Shangri-la. Or just spend your time “liming” … hanging out, and relaxing with friends. Anguilla is best for the beach, romance, watersports, food, pampering, and just escaping it all. Anguilla is one of the safest islands in the Eastern Caribbean. But use the same general tips that you would for any beach vacation, such as using the hotel safe to guard your valuables. Anguillans are known to be some of the friendliest people in the Caribbean, and the island is one of the more relaxed islands you can visit. but they are also conservative and polite. Wearing beachwear anywhere besides the beach is frowned upon. The local newspaper even reminds you to “Please shop with your clothes on.” Casual attire is generally accepted everywhere, but call ahead to the fancier dining establishments to determine whether there’s a dress code. To learn more about all the beautiful beaches on the island of Anguilla, visit here. Now view our Anguilla Island Travel Guide to help plan your next Anguilla vacation! Anguilla has a humid, tropical climate which a temperature that does not change much throughout the year. The trade winds blow from the northeast at a constant which moderate the temperatures. The hottest month in Anguilla Island is September when the average maximum temperature is 88°. The average temperature throughout the year is 84°. The coolest month in Anguilla Island is February when the average temperature is 79°. 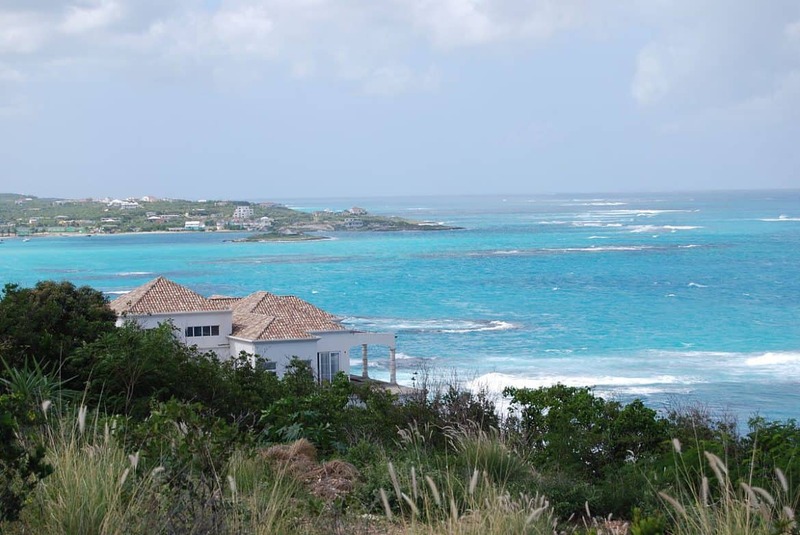 Due to the lack of mountains, Anguilla is one of the driest islands of the Lesser Antilles. Hurricane season runs from June thru November. The wettest month is October, and the driest month is February. 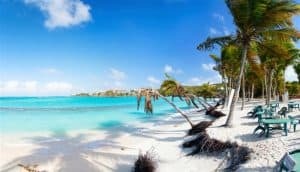 The best time to visit Anguilla is between May and August, when you stand the best chance of getting a good package deal and also avoiding the worst of the hurricane season (from June 1 to November 30). From September to November you’ll get an outstanding room deal, but selection is sparse, as many hotels and the choicest restaurants close down during these months. The average temperature is a pleasant 80 degrees Fahrenheit, but Anguilla is in the heavy throes of hurricane season and you can expect a good amount of rain, especially in October. The most expensive time to visit is from the early winter until spring when the weather is ideal. Anguilla’s peak season kicks off in mid-December and lasts until mid-April; this is also when the flight deals diminish and the hotel rates skyrocket. But the weather vouches for the influx of tourists with infrequent rain and average high temperatures in the 80s. All visitors need a passport, valid for six months beyond your arrival date, and an onward or return ticket. Occasionally, officials will also ask to see proof of sufficient funds to cover your visiting expenses. Visas are not necessary for most nationalities; citizens of some African, South American and former Soviet countries will require a visa, see www.gov.ai for information. 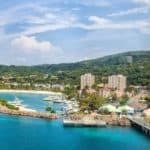 Anguilla has regular regional flights, particularly to St-Martin/Sint Maarten’s Princess Juliana International Airport (XMN), and frequent ferries to St-Martin/Sint Maarten. The best Anguilla flights is actually not to Anguilla because you’ll always have at least one or two stops before arriving. Instead, it’s often best to go via St. Maarten. Jet Blue offers the best of Anguilla flights. It’s non-stop to St. Maarten. From there you can take the ferry to Anguilla. Ferry transportation to and from Anguilla is convenient, simple and inexpensive. The ferries run all day between the hours of 7:30am and 6:15pm. Ferries run approximately every 45 minutes, and the trip takes about 25 minutes. The best way to get around Anguilla is in a taxi, as the island is too spread out to explore on foot. You’ll find the drivers make excellent tour guides, and driving yourself around town could have some problems, due to the unpaved roads and virtually nonexistent street signs. However, taxis are fairly expensive, so if you plan to explore many beaches and restaurants, it may be more cost-effective to rent a car. Taxi rates are regulated by the government, and there are fixed fares from point to point, listed in brochures the drivers should have handy and published in local guides. You’ll always find taxis at the Blowing Point Ferry landing and the airport, but you’ll need to call for hotel and restaurant pickups and arrange ahead with the driver who took you if you need a late-night return from a nightclub or bar. A temporary Anguilla driver’s license is required to rent a car—you can get into real trouble if you’re caught driving without one. You get it for $20 (good for three months) through any of the car-rental agencies at the time you pick up your car; you’ll also need your valid driver’s license from home. Rental rates start at about $45 to $55 per day, plus insurance. Avis Car Rental is going to be your best bet. Go here for rates and reservations. Consider taking the 25-minute ferry ride to St. Martin-St. Maarten for one day. Boats leave from Anguilla’s Blowing Point dock three times a day, and you’ll pay $20 one-way. The last boat of the day leaves St. Martin at 7 p.m. On top of the fare, you’ll also pay a departure tax of $20 and a security fee of about $3. Sandy’s is the beach on Anguilla for fun. So pack your towel and swimsuit, but leave your summer reading at your hotel; you won’t have time to lounge around here. 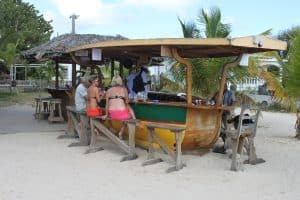 Located in front of numerous restaurants, (including the popular Johnno’s Beach Stop, Elvis’ Beach Bar and The Pumphouse), this western beach is also Anguilla’s main harbor, and it’s jiving at all times of day. Sandy Ground especially receives a lot of traffic from foreign sailors and families (all those food joints and accessible bathrooms nearby are hard to resist). Sandy Ground is a public beach open all hours every day, but visit on a Sunday to hear jazz wafting from Johnno’s. 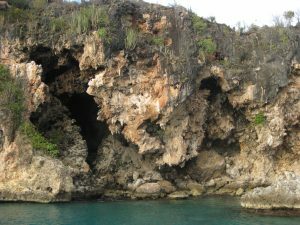 For the best diving on Anguilla, head out to this underwater cavern some 6 miles northwest of the mainland, where nurse sharks and barracuda swim through rock formations not far from several sunken shipwrecks. On land, there’s a restaurant serving food from noon to 2:30pm, and a bar. Snorkeling, diving and day-trip tour operators usually leave out of Sandy Ground. Idyllic Shoal Bay East is a shimmering, nearly deserted stretch of brilliant white sand strewn with tiny crushed shells. There’s a handful of small-scale resorts and villas as well as a string of laid-back beach bars along the sand, but it’s surprisingly quiet, even in high season. Bring your snorkeling gear (or rent some on-site), as the glassy turquoise waters are perfect for underwater observation. Designated a national park in 1985, this 14.5-acre site’s limestone terraces rise up from the sea. Its cavern is home to numerous petroglyph rock-art works created by the Arawaks around AD 300, which provide an extraordinary glimpse into their life on the island. The most spectacular is a head of Jocahu, the Arawak God of Creation, carved from a stalagmite. While the park remains open, the cavern is currently closed pending Unesco-listing status. Adventures on a Classic West Indian Sloop. Tropical Cay Lobster Lunch Cruises, sunset cruises, exclusive private escapes, and sightseeing. Enjoy luxury and indulgence on their rustic and historical trading sloop. For more information call 264-476-7245, or visit them on the web at Tradition Sailing Charters. Anguilla Watersports is the ultimate watersports location in Anguilla. 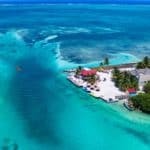 They offer everything including the Caribbean’s largest inflatable waterpark of it’s kind, kitesurfing lessons, stand up paddle board tours, and lessons and rentals. For more information call 264-584-1204, or visit them on the web at Anguilla Watersports. 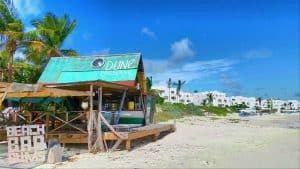 Welcome to Anguilla’s only PADI Dive Center, The Scuba Shack is conveniently located close to all major dive sites at Roy’s Bayside Grill in Sandy Ground. They will bring their love of diving together with their 25 years experience in Anguilla’s dive industry and waters, thus ensuring that you have the best diving experience while in Anguilla, in a safe, relaxed and fun environment. For more information call 264-235-1482, or visit them on the web at Scuba Shack. 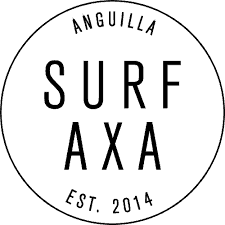 SURF AXA is an adventurous water sport company. They offer surfboard rentals and lessons along with SUP, skim boards and eco-tours. Along with weekend water excursions for the youth, SURF AXA is a surf and water sport facility for the community. For more information call 264-582-7425, or visit them on the web at Surf Axa. 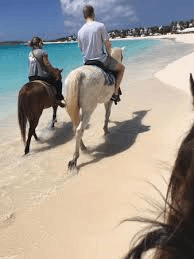 Whether you just want to blaze a bush trail or simply splash along the sea shore, you can enjoy a horse ride at any time of the day from the early morning to sunset, or even during full moon. Most of the rides are along Cove Bay an untouched, natural beach located on the southern coastline of the island. For more information call 264-235-3667, or visit them on the web at Seaside Stables. This delightful restaurant is one of the best in the Caribbean. Proprietors Bob and Melinda Blanchard moved to Anguilla from Vermont in 1994 to fulfill their culinary dreams. A festive atmosphere pervades the handsome, airy white room, accented with teal-blue, floor-to-ceiling shutters to let in the breezes, and colorful artwork by the Blanchards’ son Jesse. Creative cuisine, an upscale atmosphere, attentive service, and an excellent wine cellar (including aged spirits) please the star-studded crowd. Ever changing but always good, the nuanced contemporary menu includes house classics like corn chowder, braised lamb shanks with potato gnocchi, and a Caribbean sampler, and vegetarians have good choices. You’ll remember desserts like key lime “pie-in-a-glass” or the justly famous “cracked coconut” long after your suntan has faded. There is a also a three-course fixed-price menu ($48). For more information call 264-497-6100, or visit them on the web at Blanchards. Lunchtime finds this neighborhood hangout packed with locals: cops flirting with sassy waitresses, entrepreneurs brokering deals with politicos, schoolgirls in lime-green outfits doing their homework. The decor is nothing to speak of, but this is a great place to eavesdrop or people-watch while enjoying island-tinged specialties like beer-battered shrimp, fish-and-chips, jerk-chicken Caesar salad, snapper creole, and buffalo wings. For more information call 264-497-5353, or visit them on TripAdvisor at English Rose Bar & Restaurant. Set on a breezy poolside patio, the restaurant at Anacaona Boutique Hotel turns out huge portions of tasty Caribbean fare by a longtime Anguillian chef. The pumpkin-coconut soup is a winner, as are the local snapper, mahimahi, and crayfish. Breakfast, lunch, and dinner are served, as well as tasty drinks, bar snacks like buffalo wings and crispy calamari, and pizza to eat in or take away. Lunch and drinks can be delivered to the beach. For great value and fun, book a table at the Thursday night buffet, with a lively performance by the folkloric theater company Mayoumba. For more information call 264-497-6827, or visit them on the web at Firefly Restaurant. On beautiful Meads Bay, this restaurant continues to receive raves, with Martha Stewart dubbing it her “new favorite Caribbean restaurant.” Chef Alain (namand maître d’ Jacques have created a lovely open-air restaurant that turns out carefully prepared and nicely presented French food accompanied by good wines and personal attention. A delicious starter terrine of feta and grilled vegetables is infused with pesto. Hand-chopped steak tartare and olive oil–poached mahimahi with curry-lemongrass sauce are entrée standouts. Lighter lunchtime options include a tart cucumber-yogurt soup garnished with piquant tomato sorbet. After lunch you can digest on the beach in a Fatboy lounger, but save room for the chocolate pot de crème. For more information call 264-498-5888, or visit them on the web at Jacala Beach Restaurant. Charming owners, a gorgeous oceanfront location, sophisticated and original food, and friendly service are why this stylish restaurant has been in business since the mid-1990s. Whether for breakfast, lunch, or dinner, you will find appealing, tasty, and fresh choices to mix up or share. Try Anguilla’s only “real” bagel, tuna flatbread, jerk-braised pork belly, lobster spring rolls, or curried goat. Fish of the day is truly caught that day, and vegetarians and kids find many options, too. Big flat-screens with satellite TV make the bar a fine place to catch the game or make new friends. For more information call 264-497-8300, or visit them on the web at Straw Hat. Actually a boat, this is a great place to hear music and sip the best rum punch on Earth. You can also snack on Mexican food (try the goat tacos), play beach volleyball, or watch football on the big TV. The bar is closed Tuesday, and there’s live music Wednesday through Sunday nights in high season—plus food until 1 am. The full-moon LunaSea party doesn’t disappoint. For more information call 264-772–0637, or visit them on the web at Elvis’ Beach Bar. In an old rock-salt factory, you can dance to live music most nights, drink craft beers, and snack on pub food. A mini museum has artifacts and equipment from 19th-century salt factories. Tuesday is ladies’ night, and Monday is trivia. Dancing doesn’t kick into high gear till after 10 pm. For more information call 264-497-5154, or visit them on the web at The Pumphouse. reggae star Bankie Banx, who often performs here weekends and during the full moon. By day its the quintessential beach bar with BBQ ribs and grilled fresh seafood. At night there’s a dance floor, beach bar, small menu, and potent rum cocktails, of course. In high season there’s a $15 cover. For more information call 264-497-6219, or visit them on the web at Dune Preserve. There’s live music and alfresco dancing every night and on Sunday afternoon, when just about everybody drops by (on Sunday night, there’s live jazz). This is the classic Caribbean beach bar, attracting a funky eclectic mix, from locals to movie stars. It’s open Tuesday–Sunday from 11 to 9. 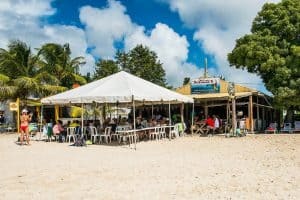 Johnno’s has a daytime lunch outpost on Prickly Pear Cay, with excellent snorkeling–-it’s a short boat trip from Sandy Ground. For more information call 264-497-2728, or visit them on the web at Johnno’s Beach Stop. Located in Meads Bay, 8 miles from Saint Martin, Carimar Beach Club features a barbecue and water sports facilities. There is a shared lounge and gift shop at the property. You can play tennis and ping-pong at this hotel, and car rental is available. The nearest airport is Wallblake Airport, 6 miles from the property. For more information, pricing, or to reserve your room now, visit Carimar Beach Club. This property is 3 minutes walk from the beach. The Fountain, located in Shoal Bay, features an outdoor swimming pool, free Wi-Fi access, and is located within a 5-minute walk to Shoal Bay Beach. The Fountain’s studio features a kitchenette which includes a microwave and a small refrigerator, while the other rooms have fully equipped kitchens. For more information, pricing, or to reserve your room, visit Fountain Anguilla. 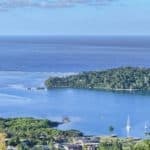 Located just a 15-minute walk from Crocus Bay Beach, this luxurious resort features a shared dipping pool, as well as a fitness centre, a spa and a wood fire pizza grill and bar. Complimentary golf cart service is available. The on-site restaurant features wood fire pizza and cocktails. The Blue Bar is open 6 days a week with a specialty breakfast menu available 7 days a week. Guests will find a wide range of alternative dining options within 1.2 miles. For more information, pricing, or to reserve your room, visit CeBlue Villas & Beach Resort. Featuring free WiFi and a year-round outdoor pool, Shoal Bay Villas offers accommodation in Shoal Bay Village, 12.4 miles from Saint Martin. Free private parking is available on site. You will find babysitting service and gift shop at the property. Snorkeling gear is available. For more information, pricing, or to reserve your room, visit Shoal Bay Villas. Easy Corner Villas features bright, fully equipped villa situated just a 5-minute drive from the beach in Sandy Ground Village. Guests enjoy a free airport shuttle service and on-site BBQ facilities. Guests at Easy Corner Villas will find a wide range of restaurants and bars within a short 10-minute drive of the property, and Cuisinart Resort Golf Course is less than 6.2 miles away. For more information, pricing, or to reserve your room, visit Easy Corner Villas. I loose track of time when I am on your site. It’s like a mini vacation of the mind and I feel quite good afterwards, and it’s cheaper, lol. I love this site. It is so beautifully done and informative. I was mesmerized by the floating banner on the pages and it works. I picked my next place and it’s St. Eustatius and I am going to get me one of those blue glass bead necklaces as a souvenir. Very informative and you give all the information I will need once I get there to have a wonderful vacation. Wonderful job. Can’t wait until next month’s destination. It’s kind of charming that they don’t like tourists walking around the island in their beach ware. I wonder if it’s leftover prudishness from it being an English colony? At any rate, it’s so devastating that these hurricanes have destroyed these small, totally tourism-dependent islands. It’s probably really hard for them to recover especially if their grid was wiped out. I hope they rebuild and the tourists start pouring in, I’m sure they need the revenue! Yes, I am sure they are wanting to rebuild quickly, because yes, most of these islands depend a lot on tourism for their economy. I don’t know about why they don’t all the beach wear, but I kind of like that idea. Anguilla is a wonderful Caribbean destination, I hope that visitors will be allowed back soon! 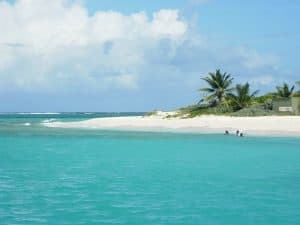 My mother would really love to read this post about Anguilla Island. The way it sounds, I’m not surprised it’s one of the most popular resorts in the Caribbean. If I was looking for a good place to travel this year or next year, this post would help me BIG TIME. It has so much information about Anguilla Island and what it has in store. I have been wanting to go to Anguilla for quite some time. I decided it was time to start looking at information and begin my planning stage, so I can get on a vacation somewhere warm! Great post. 🙂 I am looking forward to trying out some sailing on a charter boat. Looks like I have a lot of activities that will keep me busy having fun in the sun! Elvis’s Beach Bar looks like so much fun! I like that they have some fun bars and good restaurants, and now I have recommendations that I can try out. I am really interested in staying at the CeBlue Villas & Beach Resort. I do really hope that they can rebuild quickly from the hurricane so that I can start planning the dates for my vacation to Anguilla! Do you know how long it takes to have a passport renewed? This is one thing I can do in the mean time. I think you will find that Anguilla will be ready for visitors in the early part of 2018. As far as your passport goes, I would allow up to 8 weeks to receive your renewed passport. You can have it expedited, and receive it in 2 to 3 weeks, but I don’t think that is necessary in this case due to the hurricane damage, unless you want to consider a different Caribbean island. Thanks for visiting the Anguilla Island Travel Guide! Wow, what a great and beautiful website, I really love it. I have been looking online at different vacation options in the Caribbean. I do believe that you have made the choice hard for me! Anguilla has been one choice I have been considering, it is so sad they were hurt by the recent hurricanes. We are looking at going next June. Do you think that will be possible, or should we consider another island? Thank you! You know the beautiful island got hit hard by Hurricane Irma, especially with electricity, government buildings and water supply. They have hopes of being able to allow tourists in, sometime in 2018. I think I would probably choose another island for your next destination. There are so many wonderful Caribbean island and some are not in the hurricane belt, so therefore did not get any damage at all. If you need help deciding, please let me know. Thank you for visit the Anguilla Island Travel Guide! What a great website. It has a sense of peace about it. I love the website, it is so professional! I like that I could find everything I needed for taking a vacation to the wonderful Caribbean Island of Anguilla! You have certainly provided everything that I need. Can you help with vacation packages and pricing? I agree Alesia. Although, it does not get cold where I live, right now it has been dipping down to low 70s and high 60s, which is pretty cold for us! I am looking forward to a visit to somewhere in the Caribbean this winter! Thanks for visiting! This place looks marvelous. I am going to keep looking at your post and you are going to make me visit one of these places. The water looks so clear and clean. 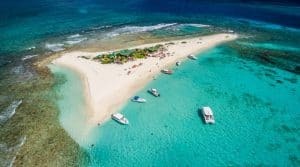 I have always had wanted to scuba dive, and trying to decide on a Caribbean Island where I can enjoy the beauty and give it a try. Your site has given me so many options! Thanks! Yes, there are lots of great diving destinations in the Caribbean. Does make it hard to chose which island you want to visit. I guess you just have to take into account what time of year you want to vacation, how crowded or quiet of an island you want, and your budget. Some islands are very budget friendly and not so crowded. If you need any additional information Ronnie, just let me know. Thanks for reading the Anguilla Island Travel Guide. Wow. The scenery is beautiful!!! I have been interested in Anguilla, as I have only been there for a port stop. I need to be adding this place to my ‘Places to Visit’ list. I would love to spend more time on the island for sure! Thanks for sharing all of your valuable information on Anguilla! You are so welcome Marlinda. Yes, I love to cruise, but I don’t consider the port stops as enough time to really get to know a Caribbean Island, or where ever they stop. It is kind of like a small taste 🙂 Glad you enjoyed! I lived in the Caribbean for two years and Anguilla is one island I didn’t get the chance to visit, and I wish I had. It sounds like an amazing place and I have no doubt that they will recover after the hurricanes. These islands have such a wonderful community spirit. I agree that they will recover and be just as beautiful as they were before. You will have to find your way to this wonderful Caribbean island for sure. Thank you so much for reading the Anguilla Island Travel Guide! I have traveled the world. From Alaska to Australia. This is exceptional, I really enjoyed reading it. It’s really informative and clear. It’s all a traveler needs to know. I would love to try the Elvis’ Beach Bar ! I like how you rate the restaurants as well. The $ sign method is super effective for a reader. Great presentation and amazing website. Makes me want to get on a plane and leave! Amazing! I’m planning on getting engaged very soon and this seems like the perfect place to celebrate (if she says yes haha). I can’t imagine a more beautiful setting and nothing else young love like open beaches and gorgeous sunsets. Ok, I sold. Thanks, the post is very informative. You are very welcome Jean, and I am sure she will say yes! And oh boy, this would be the perfect Caribbean destination for a honeymoon 🙂 Thanks for reading the Anguilla Island Travel Guide. I have not been to the Caribbean for over 30 years and from your reviews I can see Caribbean is still a great place to visit. Anguilla is one island that I did not have the pleasure to visit before and now you have really whetted my appetite to once again head back to the Caribbean. Anguilla and Saba are definitely on my list to visit possibly this winter. Thank you for an amazing review and helping me decide where to go this winter. You are welcome Moni and if you need any help planning your trip, please let me know. I would be more than happy to find you the best deals. Thank you for visiting the Anguilla Island Travel Guide! You paint a beautiful picture with your descriptions of this gorgeous island. Now, not to detract from that, my favorite part of this post came toward the end: THE FOOD! I love food, and I love variety. What you’ve described on offer from the restaurants here, that’s enough for me. This island getaway sounds… Delicious! Oh, and the beaches sound pretty nice too! Nathan, thanks for reading my Anguilla Island Travel Guide! Yeah, I am a foodie too and I like the sunshine, love a good beach and interesting things to do. But I also have to have great food and good tropical drinks 🙂 You will get all of that on Anguilla Island. I have been researching Anguilla as a possible vacation getaway, and this looks perfect for me! You have provided an awesome review, with great information to certainly help me plan the entire trip. The images really say all that there is ever to know about this location and the video confirms that assessment. Its a peaceful looking tourist resort, plenty to do and see and I would suggest that this place would be a great spot for kids also. Exactly what I have been looking for! 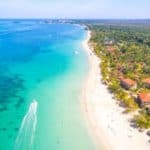 The beaches have such amazing white sand, the seas have the turquoise waters and the temperatures that you quoted for this area, suggests that its an all round sunny location. Thanks again for the great post, and helping me determine that Anguilla is definitely where I want to go! I am glad I could help you in your decision process! You will absolutely love Anguilla for all the reasons you have mentioned. It is a perfect Caribbean vacation destination. If you need anything else from me, such as finding some great package prices for you, just let me know 🙂 Thanks for reading the Anguilla Island Travel Guide! The Caribbean islands have such beautiful scenery. I have never been but would love to someday. You mentioned the cost of transportation and some food. I would be curious what one would expect to spend on lodging in the May-August time frame. It’s so sad they’ve had to deal with hurricanes this year. Hopefully they’ll be back up to full operation soon! Thanks for visiting my Anguilla Island Travel Guide Jen. The busy season is during May thru August, so expect to pay somewhat more. It really depends on the lodging. You can get a room anywhere from about $75 a night, on up for a luxury room. If you book in advance, you fair quite a bit better then waiting until the last minute. You would love visiting the Caribbean, and I think that Anguilla is one of the islands that should be visited first.